The R8 Spyder is the convertible version of Audi’s supercar, offering massive power alongside all the refinement you’d expect from the brand. The very nature of a convertible means the R8 Spyder isn’t quite as dynamically capable as the coupe version, but it’s still a potent weapon when it wants to be. Big power combines with a wonderful engine and exhaust sound that’s enhanced with the roof down. At road-legal speeds it’s a relatively calm experience, which makes it very usable. Thrill-seekers may want more everyday drama from a supercar, but it’s very hard to criticise the R8 for being so well engineered. 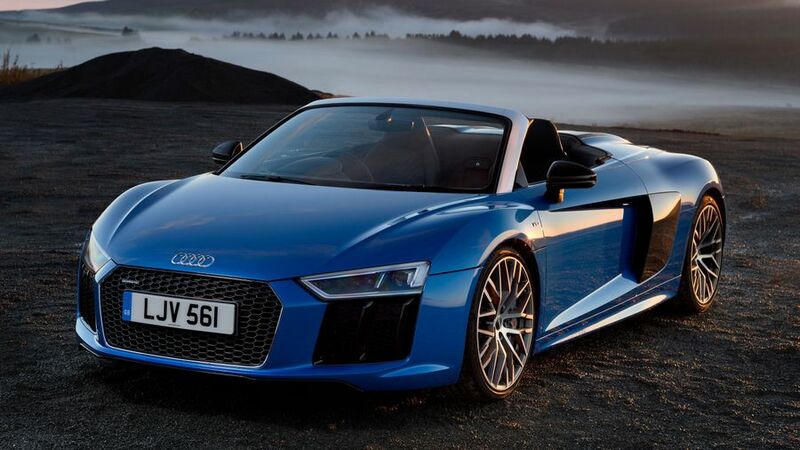 The Spyder-ised version of the R8 retains most of the coupe’s extrovert-but-classy looks, and adds a slick folding soft-top mechanism that will raise or drop in 20 seconds at speeds of up to 31mph. A range of solid, metallic, pearl effect and crystal effect finishes are available as standard, or you can opt for several Audi Exclusive colours, albeit at a cost of more than £2,000. Being a supercar, most options are on the pricey side. The ‘sideblades’ behind the doors come in silver metallic as standard, grey or black as a no-cost option, or painted for a fee. For another couple of grand, you can have them finished in a gloss carbon effect, and a Gloss Carbon Pack adds the same effect to parts like the door mirrors and rear diffuser. The more powerful R8 V10 Plus model comes with carbon effects as standard and has big carbon-ceramic brake discs lurking behind the wheels. Speaking of wheels, both models come with 19-inch alloys as standard, but you can upgrade to different designs of the same size, or larger 20-inch rims in a variety of finishes. 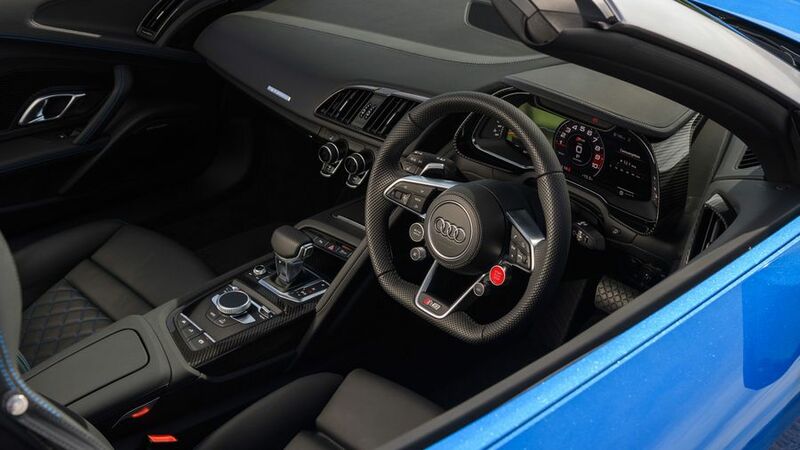 Audi rightly has a reputation for great quality interiors, and the R8 more than lives up to that with a brilliant level of material quality and solidity. It once again mirrors the coupe in design, with the addition of a button to raise and lower the roof, and another to raise and lower a glass window at the back, which helps reduce roof-down buffeting. The driving position is suitably low and compact, giving a cockpit feeling with the roof up, and there’s plenty of adjustment in the seats. 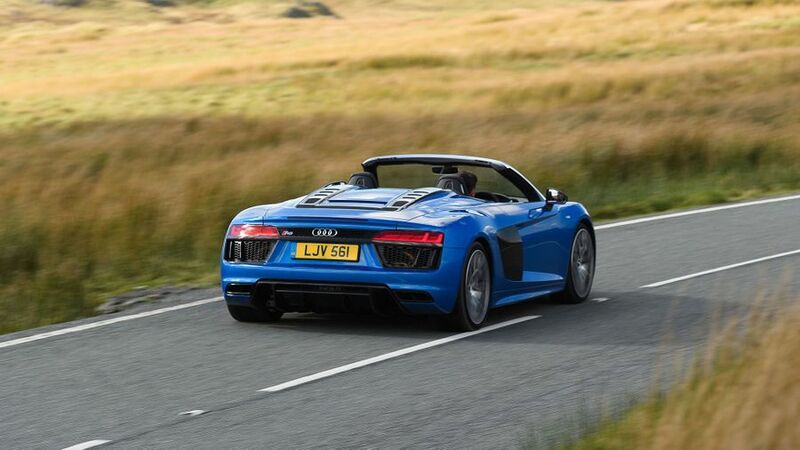 We tried the standard Spyder, which comes with excellent sports seats as standard. 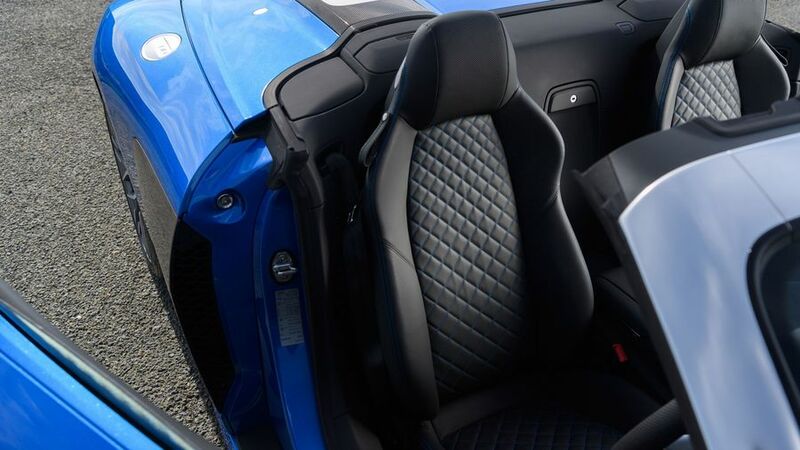 You can also upgrade to extra-supportive bucket seats, which are standard in the R8 V10 Plus. 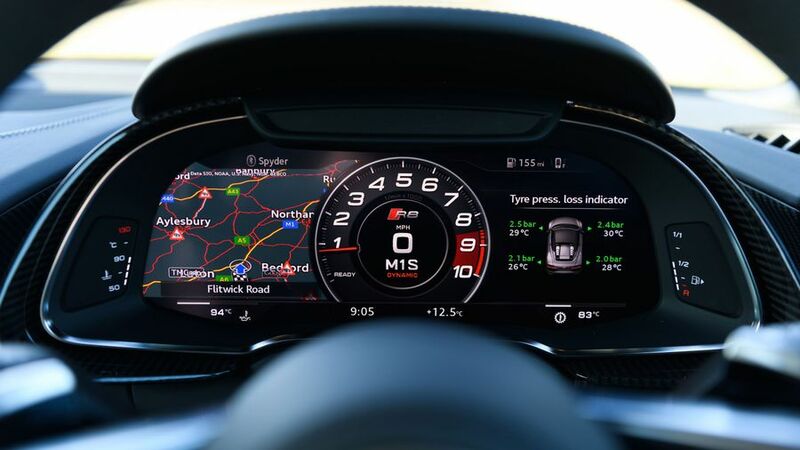 Unusually for a modern car, there’s no central infotainment screen on the dash; instead, all the driving information and sat-nav is shown on a screen in the dashboard which replaces traditional analogue instruments. Audi calls it the Virtual Cockpit. We’ve found it straightforward to navigate, using buttons on the steering wheel. 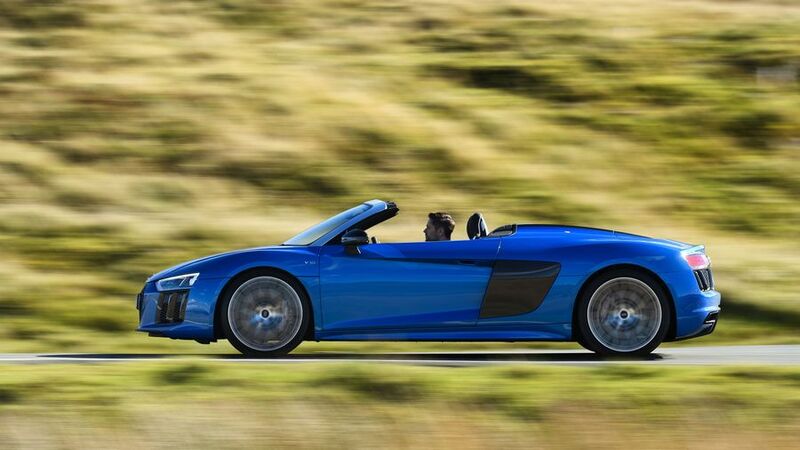 Nobody really expects a supercar to be particularly practical, which is just as well, as the R8 Spyder isn’t. Space for driver and passenger is fine, with no head-room issues even for six-footers. But the mid-mounted engine and roof storage area means there are no rear seats or boot, and the front boot under the bonnet, at 112 litres, will store a couple of small bags, but that’s it. Leave the golf clubs at home unless you want to strap them to the passenger seat (which we wouldn’t recommend). Inside, there are two cup holders, placed rather awkwardly far back on the transmission tunnel, shallow door pockets, and a small glovebox. The danger of a high-end supercar is that it focuses so much at the far end of performance that it becomes a handful to drive on the road, or is simply uncomfortable. Not so in the R8 Spyder. Although we haven’t driven it on track, we have with the coupe version and it’s tremendous. We’d expect the Spyder to be slightly less impressive due to the reduced body stiffness of a convertible, but you can’t feel it on the road. The Spyder’s great trick is to combine scintillating handling at pace, with a calm, relaxed feel when cruising. It’s perfectly simple to drive the R8 through a busy town centre in comfort. The ride is firmer than a regular saloon, but it’s not harsh. Find a stretch of open country road though, and it’ll whip through corners with fantastic body control and pin-sharp steering. 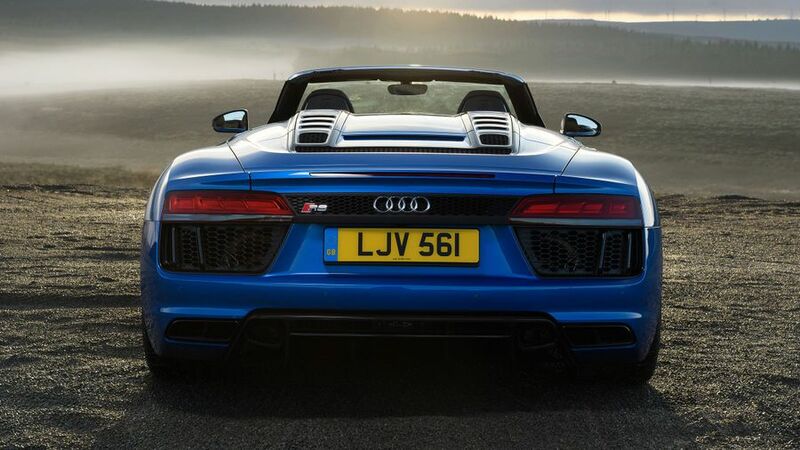 If we thought the V10 engine in the back of the R8 coupe made a great noise – and it does – then hearing it with the roof down opens a whole new level of aural enjoyment, especially with the optional sports exhaust fitted. Accompanying the glorious sound is savage acceleration, thanks to 540PS of power sent to all four wheels. And yet, once again, that brutality is kept tucked away around town; the R8 is as easy to drive slowly as a TT. 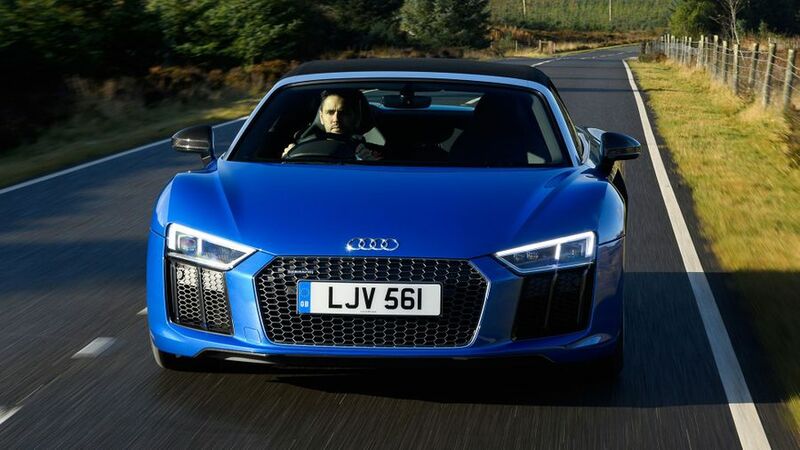 Opt for the V10 Plus model, which we’ve yet to try, and the engine is even more powerful, with 610PS. The motor is attached to a fast, smooth seven-speed automatic gearbox, which works seamlessly in full auto mode, but also gives lightning fast manual changes using the steering wheel-mounted paddles. Supercars aren’t usually bought for financial reasons – unless they’re future classics – but the R8 Spyder stacks up very well for costs when compared to its rivals. For the standard car, these include the McLaren 570S, which is considerably more expensive to buy. Closer in price is the Porsche 911 Turbo S, but with the exception of fuel economy, the Audi is cheaper to run in terms of depreciation and servicing and repair, which makes overall costs lower than the Porsche. Looking at the R8 Spyder V10 Plus versus the Aston Martin DB9 Volante and Ferrari California, the Audi again makes more financial sense, with an almost identical purchase price to the Aston, but better stats in all areas. The Ferrari fares well in terms of fuel economy and servicing costs, but loses a lot in depreciation, making it more expensive to run overall. Reliability data for the R8 specifically is hard to come by, but Audi as a brand has a below average rating on Warranty Direct’s Reliability Index. 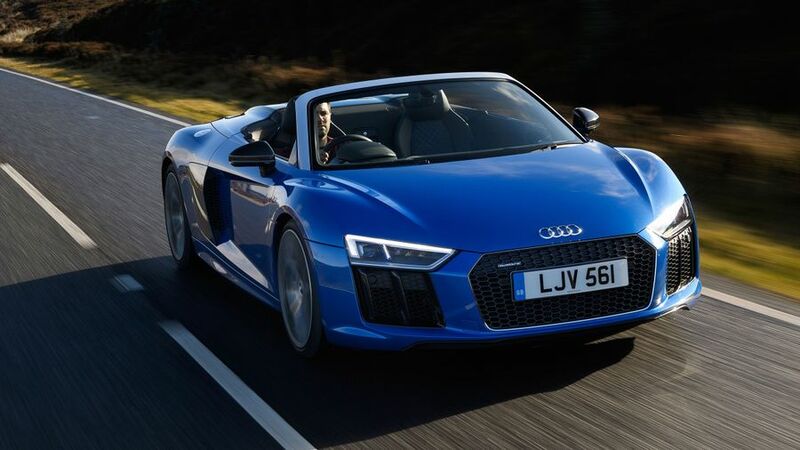 Auto Trader owner reviews on the latest generation R8 – both Spyder and Coupe – are thin on the ground at the time of writing, but owners of the previous generation car have generally been pleased, leaving largely positive reports when it comes to reliability. The R8 hasn’t been crash tested by safety organisation EuroNCAP, but Audi has an excellent reputation when it comes to safety. 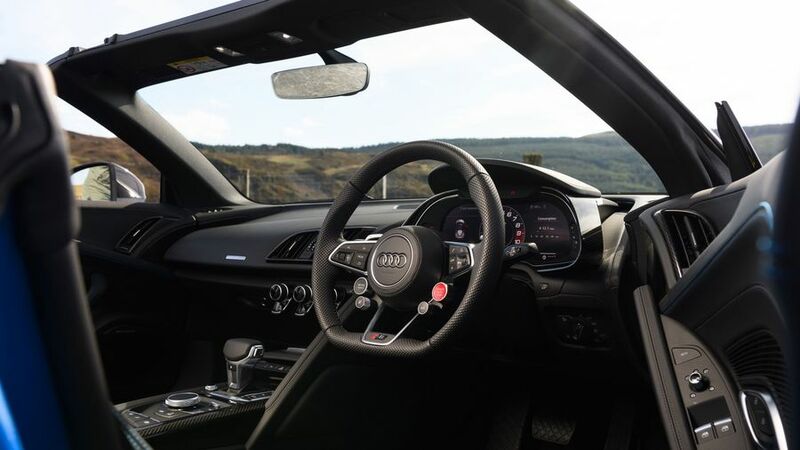 The R8 comes with four airbags as standard and an Isofix child seat mounting point on the passenger seat, but some of the more recent active safety features on the market, such as automatic emergency braking, are absent. Options include strong carbon ceramic brakes (standard on the V10 Plus), as well as clever headlights that maintain a very powerful full beam but put oncoming cars into shadow, to maximise visibility but avoid dazzling other drivers. 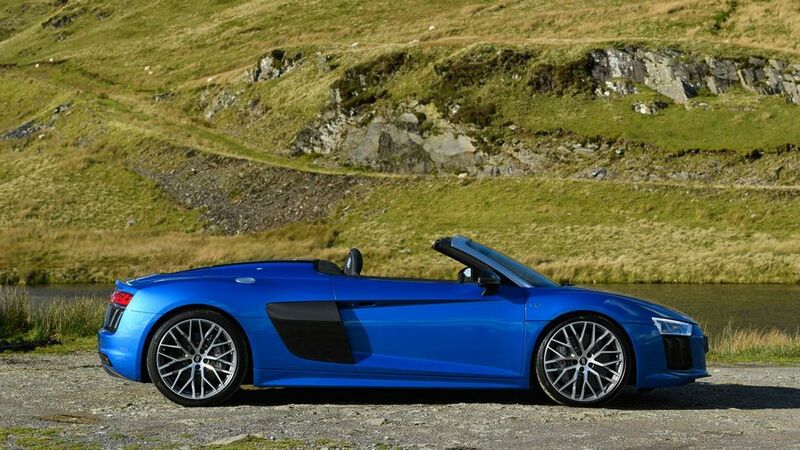 It’s entirely possible to take an R8 Spyder straight out of the box and not want for equipment. The snazzy digital dashboard with sat-nav is standard on all cars, as is a range of leather upholstery colours on the electric, heated seats. Curiously, you’ll have to pay for cruise control though. The options list is extensive, and the well-heeled will find plenty to tempt them to part with extra cash. Notable additional kit includes magnetic dampers for an even-more controlled ride, and a Bang & Olufsen sound system. Because you want a supercar experience that you can use on the road every day. We think a small compromise in handling at the limit, compared to the R8 Coupe, is well worth it for the extra sound and wind-in-your-hair fun the Spyder offers. It’s great to drive, brilliantly engineered and good value compared to its rivals, too.